A hearty bowl of chili warms the body and soul as no other dish can. Easy to make, nutritious, economical, and adaptable to any diet, this deliciously spicy dish is quite possibly the most popular (and highly debated over) form of stew in the United States. Is it spelled chili, chile, or chilli? That depends entirely on one's location. "Chile" (i.e. "chiles rellenos") is the Spanish word for any type of hot pepper. The stew is named after the chile pepper (Capsicum annuum), the one ingredient found in every chili recipe variation. "Chili" is the typical American spelling for the dish. "Chile" is also an acceptable American variant, sometimes used to differentiate between the stew and hot pepper. The plural for either is "chilies" or "chiles". The Brits use "chilli" (plural "chillies"), for the stew and for both hot and sweet peppers. "Chilly", meaning uncomfortably cool or cold, is neither the correct spelling, nor is it the appropriate serving temperature for this dish. What is in chili aside from hot peppers? In its simplest original form, chili is simply a beef stew made from cubed beef simmered in liquid with chilies and cumin. Traditionalists frown on chili variations that deviate too far from the original. However, stew is a versatile dish designed to use ingredients at hand, so the list of ingredients that cooks add to their own recipes is as varied and personal as the cooks who are making it. Choosing ground meat or chunks; meat, no meat; beans, no beans; tomatoes, no tomatoes; white beans, black beans, and/or pinto beans; corn, pineapple, tomatillo; molasses, bourbon and nut butter and virtually everything in between affords a personal take on this robust dish. What is the best chili recipe? JOHN: We just got back from our honeymoon in Chile last week. We saw some amazing stuff there. MATT: Oh, cool! That reminds me, I finally perfected my amazing five-alarm Superbowl chili! One of the most popular food competitions in the United States, a cook-off can be an informal gathering for sharing recipes and enjoying food, or it may be a large-scale event with an official panel of judges and substantial prizes for winners. Three Sisters Weekender Chili is my entry for the Bush’s Beans Chili Cook-off with The Daily Meal. 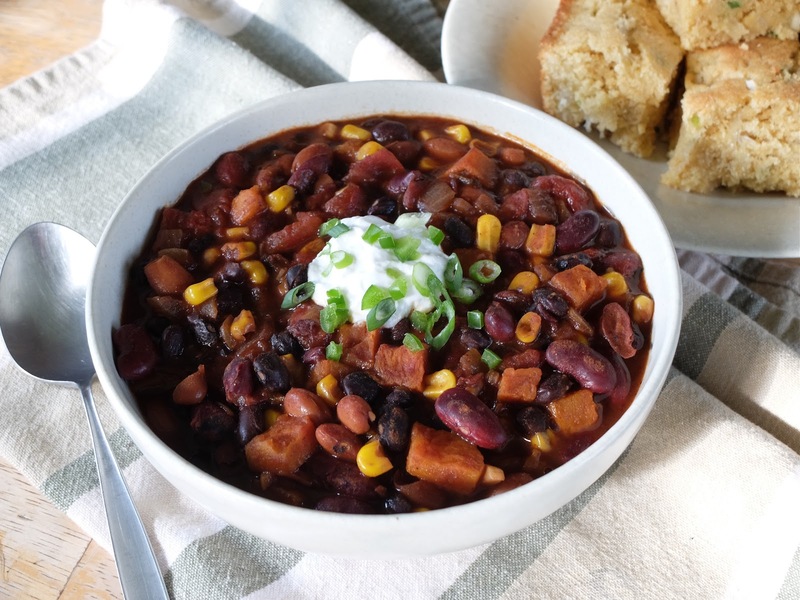 Modified slightly to meet the contest requirements, this chili is a vegetarian/vegan dish: simply substitute the dairy toppings with vegan-friendly options. 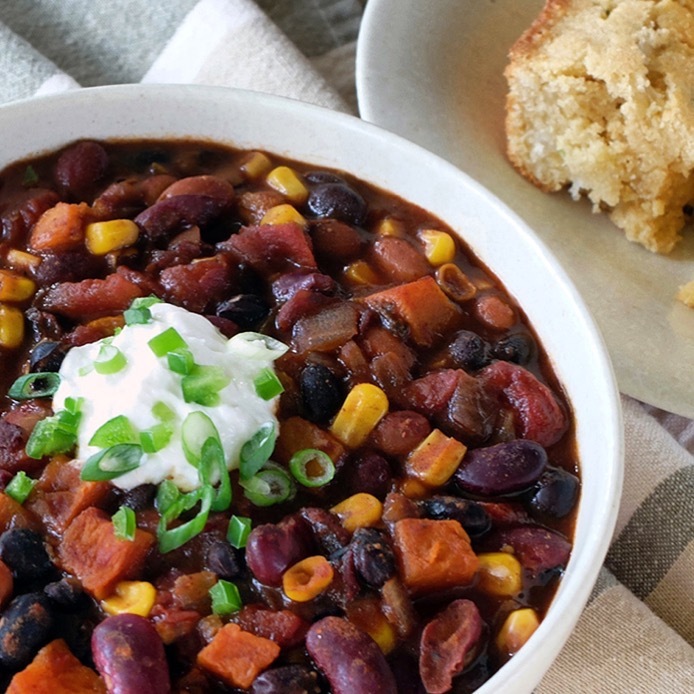 Vegetarian chili relies heavily on beans, nuts, or faux meats as the protein component. Here, a mix of black, pinto, and red kidney beans adds welcome variety. BUSH'S® Chili Beans come in mild, medium and hot spiciness; choose your favorite heat preference and make this chili your own. Roasting the corn and squash gives this chili an extra boost of meaty flavor without having to rely on Adding molasses tempers tomato’s acidity and helps keep the beans firm. The optional chipotle chile adds a little extra depth and heat, resulting in a rich, spicy flavor. The Native American tale of the Three Sisters teaches how corn, beans, and winter squash are interplanted to help support and nurture each other. This vegetarian roasted squash chili recipe blends fresh, frozen, and canned goods into a harmonious, satisfying chili. Preheat oven to 450°F with racks positioned on middle and lower thirds. Toss butternut squash with brown sugar, 1 teaspoon salt and 2 teaspoons olive oil on a rimmed baking sheet. Arrange squash in a single layer; roast in middle of the oven for 20 minutes, turning occasionally with spatula until squash is tender and lightly browned, 20-25 minutes. Remove from oven; set aside. Spread frozen corn in a single layer on a small rimmed baking sheet lined with parchment. Roast corn in lower half of the oven until lightly brown, about 10 minutes. Remove from oven; set aside. Meanwhile, start the chili. Heat remaining oil in a large saucepan over medium heat. Add onion and cook until soft and the edges are slightly brown, about 6 minutes. Add garlic and cook until fragrant, about 1 minute. Stir in molasses, optional chipotle, and oregano. Add tomatoes with juice, beans, and water; stir well to combine. Bring to a boil, then reduce heat to low, cover with lid slightly ajar, and simmer for 25 minutes. Adjust seasonings to taste with salt and freshly ground black pepper. Stir roasted squash and corn into chili, and simmer uncovered over medium-low heat for another 10 minutes. Season to taste with additional salt and pepper, as desired. Divide chili among bowls. Serve with desired toppings, some homemade (or store-bought) cornbread and your favorite cider. Enjoy!